A prose poem is a poem written in prose rather than verse. But what does that really mean? Is it an indefinable hybrid? An anomaly in the history of poetry? Are the very words "prose poem" an oxymoron? This groundbreaking anthology edited by celebrated poet David Lehman, editor of The Best American Poetry series, traces the form in all its dazzling variety from Poe and Emerson to Auden and Ashbery and on, right up to the present. In his brilliant and lucid introduction, Lehman explains that a prose poem can make use of all the strategies and tactics of poetry, but works in sentences rather than lines. He also summarizes the prose poem's French heritage, its history in the United States, and the salient differences between verse and prose. 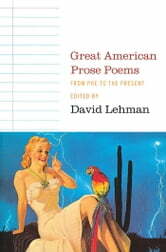 Arranged chronologically to allow readers to trace the gradual development of this hybrid genre, the poems anthologized here include important works from such masters of American literature as Gertrude Stein, William Carlos Williams, e. e. cummings, Hart Crane, Ernest Hemingway, James Schuyler, Allen Ginsberg, Frank O'Hara, and Elizabeth Bishop. Contemporary mainstays and emerging poets -- Robert Bly, John Ashbery, Charles Simic, Billy Collins, Russell Edson, James Tate, Anne Carson, Yusef Komunyakaa, and Lydia Davis, among them -- are represented with their best work in the field. The prose poem is beginning to enjoy a tremendous upswing in popularity. Readers of this marvelous collection, a must-have for anyone interested in the current state of the art, will learn why.